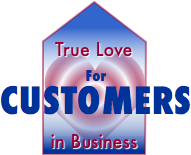 True love for customers reveals how nonprofit, commercial and government organizations of all sizes can create much stronger relationships and business by transforming how they relate to customers. Philosophers, clergy and psychologists have long acknowledged love as the most powerful force between humans. Love connects people like nothing else can, I think because love touches and binds together so many parts of the brain simultaneously: Love stimulates the reptilian brain because it’s related to survival. It is central to the limbic brain, which is grounded in emotion and memory. And love throughly engages the neocortex in art, ideals, and many other forms.